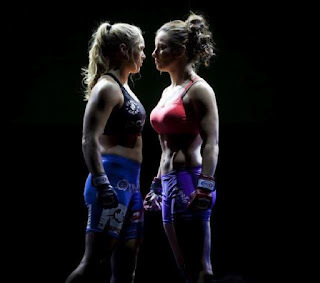 This Saturday, March the 3rd in Columbus, Ohio on Showtime, Strikeforce presents one of the most anticipated fights ever in Women's MMA, Ronda Rousey vs. Miesha Tate. They are fighting for the Women's Bantamweight Championship (135 pounds). Miesha Tate currently owns the title. Background on Ronda Rousey... Ronda Rousey is an American Judoka from Santa Monica, California. She currently trains with coaches Gene Lebell, Gokor Chivichyan (Team Hayastan), and Leo Frincu. Aside from being a 4th Dan Black Belt in Judo she is ranked #3 of being one of the world's greatest ever Judokas. She is an Olympic Bronze medalist in the sport. Background on Miesha Tate... Miesha Tate is a mixed martial artist from Sacramento, California. She currently trains with the Team Alpha Male team. She has trained in Grappling (BJJ) and Wrestling. She is the #1 ranked pound-for-pound fighter in the 135 pound weight class on the planet. Miesha is the current Strikeforce Women's Bantamweight Champion. What are both opponents known for? Ronda "Rowdy" Rousey is known for making other women tap out in a matter of seconds due to her famous armbar submission. Miesha "Takedown" Tate is known for a variety of submissions, her latest being an arm triangle choke, which scored her "Submission of the Month" on ESPN and allowed her to win "Submission of the Year" at the MMA Awards. Who do I think will win? Without a doubt, Ronda Rousey. Although we have yet to see her striking, her ground game is much superior. Miesha has a weakness. Several actually. One of them being that every time she goes after an opponent, she attempts to get them into a clinch and push them to the side of the cage, getting the takedown earlier. She does this with every fight, which gives an edge to Ronda who is a 4th Dan Judoka. Judo is a superior ground fighting to Brazilian Jiu Jitsu, as well as, Sambo. Why? Because this martial art actually lead to the innovation of both styles of fighting. I think BJJ and Sambo are both incredibly effective, but not as effective as Judo. It is one of the best ground fighting martial arts ever next to actual wrestling. Definitely looking forward to watching. I do think it will be relatively more competitive than most fights we have seen lately in WMMA. The other fight that I was looking forward to is no longer going to happen. My friend Roman Mitichyan's friend Gegard Mousasi was suppose to fight Mike Kyle. Mike Kyle apparently withdrew due to injury, but I definitely had Gegard Mousasi chosen to win that particular fight simply because he is a fabulous striker, as his boxing is way above average in MMA and he is very familiar with Judo. I guess he couldn't find someone to fight in the amount of time since Mike Kyle withdrew. I think the winner of this fight (Miesha "Takedown" Tate vs. Ronda "Rowdy" Rousey) should take on the incredible Sara McMann. Strikeforce: Tate vs. Rousey is this Saturday (so mark your calendars) and starts at 8 pm EST (6 pm my time, here in Montana). Prelims start about an hour or two earlier. Check your local listings for more information. Homemade buttermilk pancakes made with all purpose flour, buttermilk, sugar cane juice, vanilla extract, butter, and a hint of Frangelico liqueur and topped with French vanilla ice cream, raw maple syrup, raw honey, chocolate syrup, honey roasted sugar coated almonds, and homemade whipped cream using Silk's almond milk in vanilla. Made by Sarah Afshar. 4 oz. A&W Cream Soda. 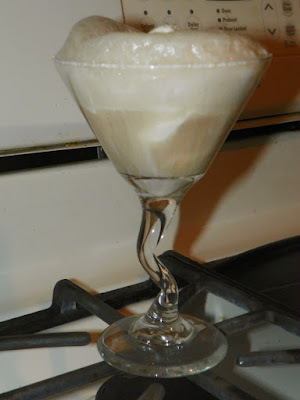 Combine the Pinnacle Cake Flavored Vodka, Qream Strawberry Cream Liqueur, Godiva White Chocolate Liqueur. Add the French Vanilla Ice Cream (you can substitute this for soy ice cream too if you are vegan or lactose intolerant, etc), followed by the A&W Cream Soda. It is amazing and if this doesn't serve as proof, I don't know what else will. Who made top 1000 writers for 2011 on Yahoo?! This girl! Recently, I received a message from Yahoo! Voice and the contributor network that I am one of the top 1000 writers of 2011. Definitely an honor coming from such a credible corporation with such good standing and great repute.